Just trying to keep my motivation going across all of my projects so wanted to show some of the progress (slow as it is) I’ve been making with my B&P stuff! Going all in for the "admiral" pledge level means I’ve been sluggish at best with painting, but there has been some progress! Trees/forest tiles – I've made quite a few with some awesome plastics from Amazon – I've seen a lot of these around on Firelock games' site and the FB group. They're from the Amazon store Highly One with Trees and Shrubs both being great value! 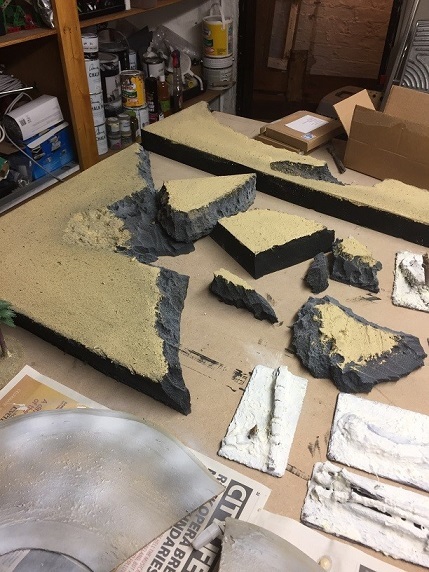 Also some WIP Hills/islands as invented by Beasts of War as seen here. They need some flock (and some better photographs!) but are coming along nicely! Of course, any good pirate game comes with ships! Gone for a civilian/private/waling ship vibe with generic colours….possible changes: might change the prow colour to brown again…. Needs detailing, possibly going to drybrush highlight too but not sure…. Black and red (the red need alot more work…) as per the Acheron! Obviously much to do still! What so you guys think?